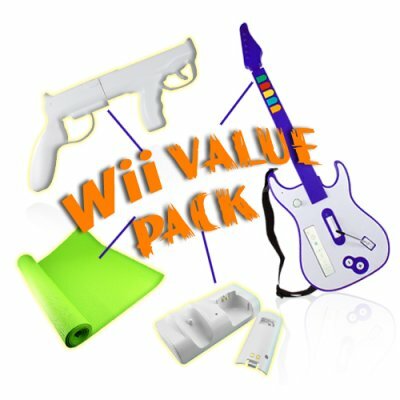 Successfully Added Wii Value Pack - Charge Station + Lite Gun + Guitar + Yoga Mat to your Shopping Cart. (2) Air Guitar Who doesn’t love the guitar? No body, that’s right. Just like millions of people, enjoy playing your favorite guitar hero games, with this realistic, powerful and beautiful guitar that is designed for wii and guitar hero lovers. Feel like a true rock star, feel the rush of playing guitar hero with this remarkable unit will never leave your memory. (3) Keep Fit Mat That's not all, coming with this value Nintendo wii pack is also a 4 in 1 keep fit Mat. Improve your board game experience with this Mat which also includes a charger for your wii board and two specially made ergonomically designed socks that enhances the grip of your foot onto the Mat, that lets you improve your gaming needs with greater performance. (4) Charging station Included is a charging station that supports two function. (1) Charging of your Wii controllers. (2) Holder for your wii nunchuks. No you can charge your Wii controllers with simplicity and easy. The value added Nintendo wii accessories all come in a cool fashionable white color to match your Nintendo Wii game console, and with lightning speed response time to the controls you'll hardly stop playing. Well, there you have it, a multitude of Nintendo wii accessories at a factory direct wholesale price. The 4 in 1 Nintendo wii value pack makes the best Christmas gift ever imaginable. This exclusive deal of a lifetime is in stock now, and available to your from the greatest world electronics exporter, Chinavasion. Photography & Graphics By: L.H.